As good as the iPad 2 is, there are some specific bits of gear that take it to the next level and upgrade it from "Cool and Useful" to "Awesome and Indispensable." After spending a full year with his iPad as a constant companion, there's an small but intense inventory of accessories that columnist and Apple iOS expert Andy Ihnatko can't do without. 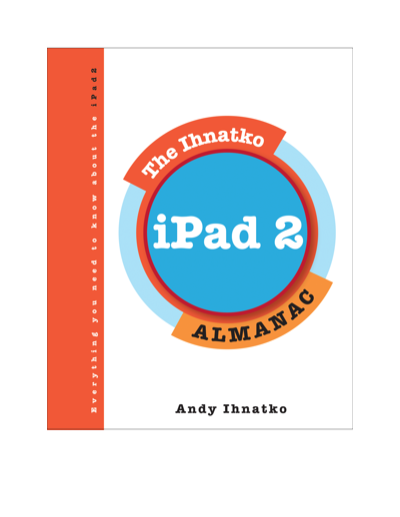 He shares his favorites for the iPad 2 in this chapter from his upcoming book. Prefer to read this chapter on your iPad? Lucky for you it is also available as a DRM-free EPUB download. If you need help loading this EPUB file onto your computer, eReader, or mobile device, visit our eBook Formats FAQ for tips and assistance. This chapter, my fellow sensation-seekers, is all about finding the courage to spend even more money on iPad-related hardware. Yes, I said courage. When you're still ducking the stink-eyes that have been plastered all over your loved ones' faces ever since you came home with a new iPad instead the family tickets to see "Disney On Ice," that you promised to spend the household mad money on, you can't spend even more money on accessories without tapping into the gutsy spirit of The Greatest Generation. Plus, maybe the budget for your three kids' after school sports fees for the rest of the year. It's a smart use of your funds, anyway. The kids wouldn't have learned anything from The Little Mermaid's Magical Princess Adventure that they weren't going to pick up on the streets eventually, anyway. And as good as the iPad is, there are some specific bits of gear that take it to the next level and upgrade it from Cool and Useful to Awesome and Indispensable. After spending a full year with my iPad as a constant companion, there's an small but intense inventory of accessories that I can't do without. The iPad only has a few intrinsic drawbacks. At the head of the list: neither God nor Humankind has yet built a pair of pants so large that you can just slide it in a back pocket. You're going to have to carry it around, and you'll need to put it in some sort of case for protection. I've yet to find a carrying bag that's good enough to bless for universal consumption ("good enough" is too highly-subjective a concept). And I continue to be baffled by iPad cases that do nothing more than surround this slick, beautiful sheet of technofab inside a chunky box of padded vinyl. Pass! Instead, what you need is a slim jacket that adds little extra bulk but which (a) protects the screen from the slings and arrows of outrageous fortune (and the cast-iron souvenir model of the Washington Monument you forgot you had in your bag when you threw in your iPad), (b) makes the iPad a little "grippier" in your hands, so you won't drop it when you get to that really shockingly horrifying scene in The Shining, and (c) converts into a stable tabletop easel. You want at least two stable angles: upright for reading, watching video, and conducting video chats, and a slightly elevated angle for comfortable typing. Leave it to Apple to obsess over an iPad case. But I suppose their design for the iPad 2's Smart Cover represents a certain amount of remorse over what they did with last year's iPad case. The easel stand they released with the first iPad seemed like an afterthought. It was a tacky vinyl envelope and the one thing it did most successfully was make your iPad look so cheap and boring that nobody would want to steal it. The cover they designed for the iPad 2 (no, it won't work on the original iPad) is just as much a boast about Apple design as it is a practical iPad case. It gets the job done — including the "protect the screen" mandate — while adding next to nothing to the iPad's size and taking away exactly nothing from its iPad's style. It clicks on with powerful magnets (aided by complementary magnets inside the iPad itself) and aligns itself perfectly almost every time. The hinges allow the cover to fold flat against the back of the iPad. Or, you can roll it up: more magnets inside the cover hold it into a tight triangular bar shape. It nicely props up the iPad vertically for movie viewing or FaceTime, or it'll leave the iPad flat at a comfortable elevated typing angle. And the cover is part of the iPad experience, too. Lift the cover and the iPad wakes; you don't even need to fiddle with the standard onscreen Unlock slider. Close it and it goes back to sleep. Slick. It's pricy for what it is: $39 for the polyurethane models (available in an array rainbow colors that say "I'm fresh, I'm free, I'm a quirky iconoclast who's nothing like my parents") and $69 for the leather ones (which feel great, will age well, and say "I could afford the extra thirty bucks; how about you, ya damn hippie?"). Other manufacturers will make knockoffs for $20 or $30 but I doubt they'll be as well-engineered as Apple's original. The iPad 2 case is slightly magical, yes (it has magnets), but it has some limitations. It only protects the screen; the iPad's metal back will acquire its share of scratches and scuffs. The cover only fits the iPad 2. And as a stand, it only offers two angles: upright and flat. The $45 FoldIO from Scosche (www.scosche.com) solves all of those problems. It's a full folio case that surrounds your iPad in a sturdy, leather-like shell. It's thicker than Apple's cover, which augurs well for the "protection" part of the competition, while remaining thin enough to maintain the grace dignity of the object. Your iPad settles into it via corner clips that leave your fingers free to roam the full acreage of glass. You can still fold the cover around the back for comfortable reading and for added drop-proofey grippiness. Its Big Win is its adjustability. You can tilt your screen into five different angles. You can find the most comfortable viewing angle with the least glare. If you're using the Apple cover (and most other easel stands) you're forced to adopt a Calvinist attitude of "I was meant to suffer like this" and simply forge ahead as best you can.